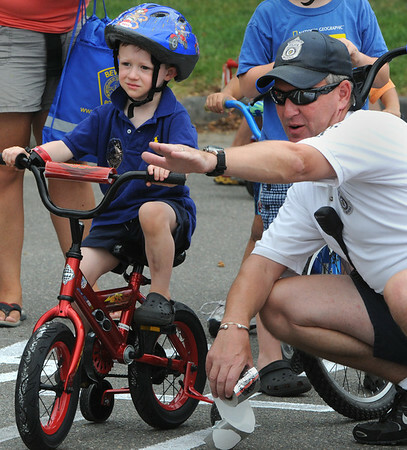 Salem police officer Jay Derobertis directs Harrison Stanton, 3, at the start of the bicycle course during the Bicycle Safety Rodeo at Lynch Park. The Beverly Kiwanis Club and Beverly Police Department sponsored the annual Bicycle Safety Rodeo as part of the Beverly Homecoming. Photo by Ken Yuszkus/Salem News, Monday, August 1, 2011.